With goldenrod color yarn, CO 20 sts. Knit 4 rows. Break goldenrod yarn and switch to Greystone yarn. Repeat steps [3 to 4] until piece measures 5 inches. Make sure you end on step 4 which is the WS. Break Greystone yarn and switch back to goldenrod yarn. Bind off all sts. Break yarn leaving a long tail. Fold piece in half with the goldenrod borders touching. With tapestry needle, use long tail left over to sew up edges together leaving a thumbhole approximately 1.5 inches wide. Securely tie off ends. Make sure that for the 2nd piece the thumbhole is placed properly so that both pieces mirror each other. 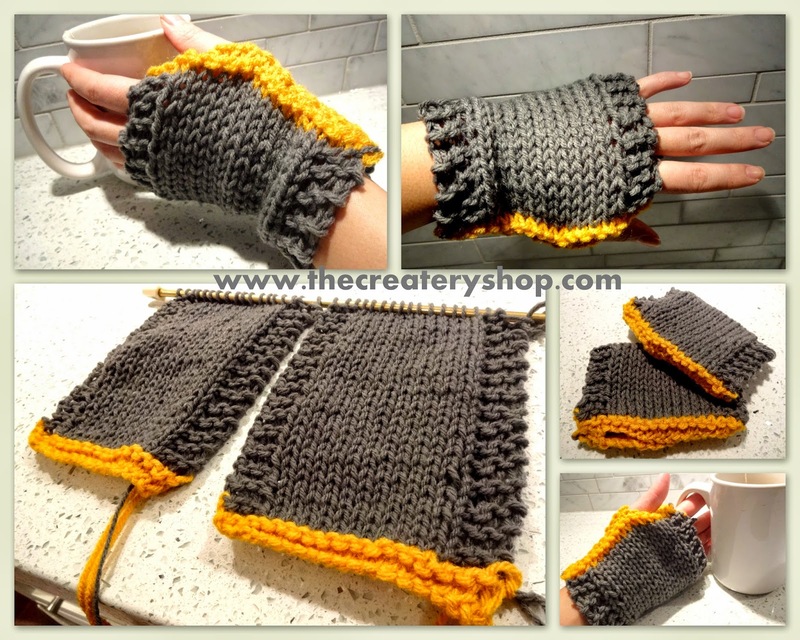 Slip on hand warmers and wow your friends by telling them it only took one evening to make them! Thank you for the free patterns! I really like this little wrist warmers. I'm going to try making them. Awesome! I love this pattern!